If you had a Charmed phase as an adolescent, there’s no doubt those words bring up several memories almost immediately. Over the course of eight seasons and 178 episodes, The WB’s Charmed told the story of the Halliwell sisters, a.k.a. the Charmed Ones, three sibling who just so happened to be the most powerful witches on the planet. Charmed closed the door on San Francisco’s Halliwell Manor for good in May 2006, but now The CW is opening a new door—and can of worms, based on certain fan responses—with the Vera sisters of Hilltowne, Michigan (a.k.a. “Hell Town”). That, essentially, is the new version’s hook: Like the original, the reboot allows its audience to pick their favorite Charmed One immediately, as the only thing these three witchy sisters have in common is the fact they’re three witchy sisters. Macy Vaughn (Madeleine Mantock)—the oldest and long-lost sister, with the power of telekinesis—is a molecular geneticist who tries to explain this whole magic thing in terms of science. Mel Vera (Melonie Diaz)—the middle sister, with time-freezing powers—accepts this whole witch thing the most and also waves the “girl power” flag the proudest. Finally, Maggie Vera (Sarah Jeffery)—the youngest sister, who can read minds—is a college freshman who just wants a normal life. While it’s not a carbon copy of the sister-power dynamics of the original, fans of the Halliwell sisters will surely see the parallels here. Specifically, the “normal life” sought by original series’ Piper (the middle sibling-turned-oldest) and this version’s Maggie: In an eight-season story about the most powerful witches in the world, the idea of any of them aggressively wanting a normal life eventually got frustrating. Maggie’s focus, in this vein, is fitting into the world of collegiate Greek life. Though the series itself doesn’t commit to being anti-Greek, and Maggie explains why she wants to be part of that world after her mother’s death, it’s never fully explained what draws her to it prior to her mother’s death, which makes it more difficult to see what she considers the good qualities of Greek life in the first place. And because of how supernatural stories (and especially superhero stories) have evolved since the original Charmed, the “reluctant heroine” archetype has become harder to latch on to. While there’s a moment where Maggie addresses that she and her sisters now have legitimate, deadly targets on their backs, the fear for her life strangely isn’t her biggest dilemma. (It also remains to be seen how death will be handled on the new Charmed, since death was only treated as truly final in the original when it killed off Shannen Doherty’s Prue.) The pilot doesn’t have time to delve into how these new powers and responsibilities will actually hurt Maggie’s chance at a “normal life”—other than her hearing what her prospective sorority sisters really think of her, as someone with a dead mom and the need to work for a living—but the series will have an uphill battle when it comes to making us care about how she juggles being a badass witch and… making it to the latest themed sorority party. Promoted as a “feminist” version of Charmed—to be clear, this is to say that it’s more explicitly so than the original, not that the original wasn’t feminist—the new version depicts the differences between well-meaning male alles and literal monsters—and how the former can be warped, both in reality and through magic, into something more like the latter. This series’ Whitelighter, Harry (Rupert Evans), is introduced essentially as the stereotypical “male feminist,” calling one of the Charmed Ones “hostile” one moment and then gloating about how Roxane Gay retweeted him the next. It’s at once humorous and possibly troubling, and this Charmed knows the right time to make those shifts. In fact, while there’s a darkness here compared to the original—perhaps because it’s filmed in Vancouver instead of sunny Los Angeles—the new Charmed is not humorless. The pilot has more of a balance of heavy emotion and lightness than I expected, and the most surprising thing about the new Charmed—something you wouldn’t get from the promotion of the series, by The CW or the cast, writers, and producers themselves—is how it doesn’t forget to be fun within a contemporary, #MeToo/#TimesUp context. Original Charmed eventually went so far past camp it became a parody at times—the fifth season had any mythological or fairy-tale creature the writers could think of—which is another reason why a reboot makes sense instead of a revival. New Charmed has a clean slate to present its own brand of humor, without betraying the serious aspects of the show. The new Charmed’s biggest struggle might be that its goals are too lofty for its abilities—at least this early in its existence. While the pilot certainly provokes a desire to see more of how it handles this version of the Charmed Ones, it also feels rushed because of how many beats it has to hit, and how much it can actually fit, in 40-plus minutes. The original’s biggest issue was the opposite—how much it chose to stay within its comfort zone and keep things simple. Here, outside of the sisters’ relationship with each other, no other dynamic has enough focus, at least so far. 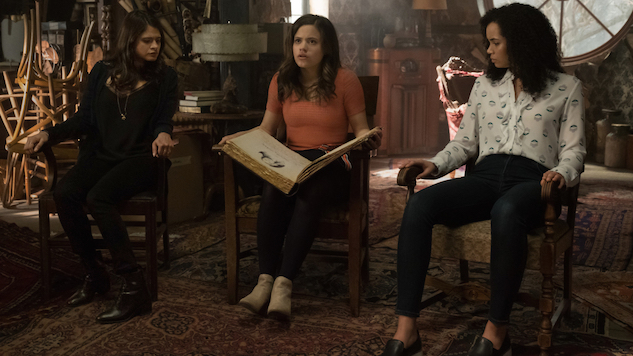 As the season progresses, there’s potential to let these stories breathe, and that’s the keyword for new Charmed: “potential.” All it needs to do is nurture that. Charmed premieres Sunday, Oct. 14 at 9 p.m. on The CW.